Southwest of New Zealand is the small town of Te Anau. The town gets its name from the similarly named lake beside it, the largest glacial lake in South Island. Lying north to south, Lake Te Anau is the gateway to the Fiordland National Park, a World Heritage Area and the home of the Sounds. 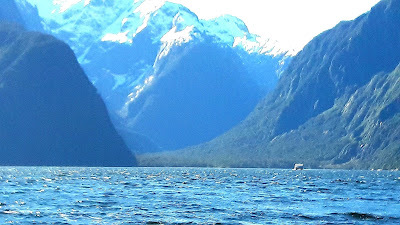 A Sound, technically a fiord (that's how it's spelt in NZ), is a large, deep body of water that was formed when a glacier slid down the side of a mountain and in the process, carved out a valley, allowing water from the sea to flood the space. Near-vertical sides of the surrounding mountains that reach down all the way to the floor of the valley thus formed are characteristics of a Sound. We were booked at the Lakeside Motel and Apartments. Our apartment faced the incredibly blue waters of the lake, a lone boat sailed on the calm water. A little black lamb was tied to a post in the yard and we had just enough time to pat its head and take a few pics before leaving our luggage at the reception counter. 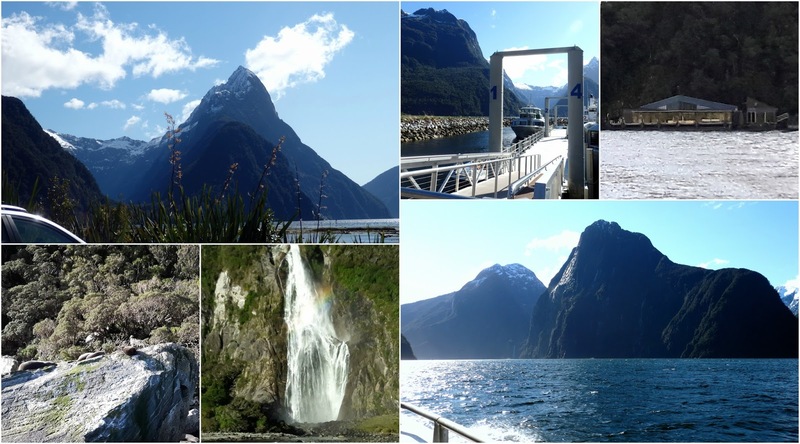 We had a 120 kilometer drive ahead of us to Piopiotahi (a piopio is a bird that is now extinct) for the Mitre Peak cruise to Milford Sound, named after Milford Haven in Wales. The drive through Fiordland roads was scenic as well as dramatic - steep hills, a Chasm, valleys, gushing rivers and waterfalls that could be seen between the trees. We had a bit of a wait at the Homer Tunnel to allow traffic from the other side to pass. 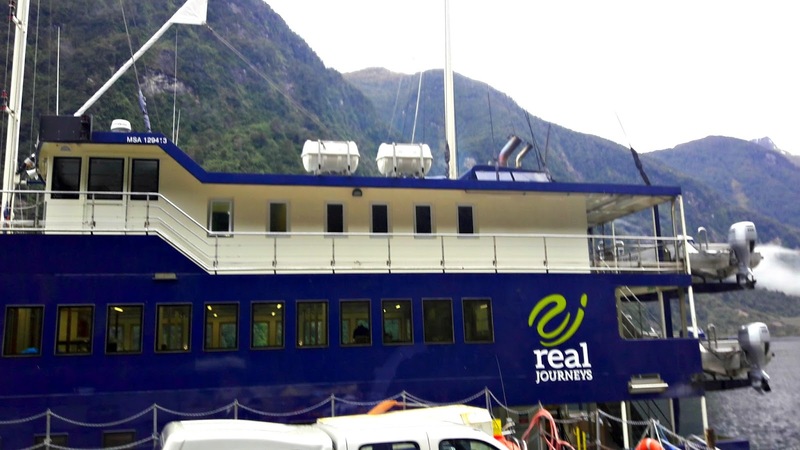 At the Milford Sound Visitor's Centre, we boarded the boat for a 2 hour ride around the Sound. 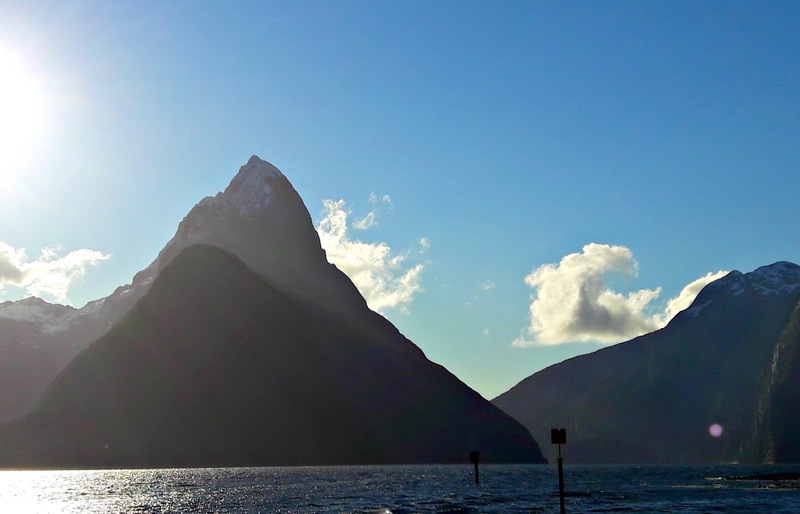 Perhaps the most famous elevation of Milford Sound is Mitre Peak. The movement of glaciers during the Ice Age carved out these magnificent fiords and the towering cliffs that rise dramatically are truly a sight. Some of the peaks are so high that even if you crane your neck, you can't quite see the top. It rains quite often in the Sound and with the biting cold winds, it was tempting to sit in the enclosed cabin and look out of the windows. But then, we would have missed our close ups with Elephant Rock, Lion Mountain, the rainbow across Bridal Veil Falls, the spectacle of water cascading down Bowen Falls (even higher than the Niagara Falls) and Stirling Falls where the water drops from a U-shaped hanging valley. We cruised right up to the where the Sound meets the Tasman Sea before slowing down near Seal Rock to watch a herd of seals sunning themselves. Harrison Cove is where The Milford Sound Discovery Centre is located. Under the crystal clear water is the floating undersea observatory. 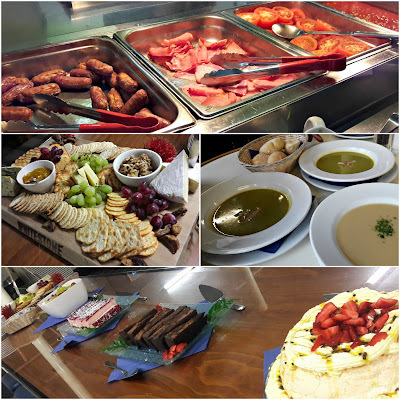 It was late in the evening when we returned to Te Anau. After the freezing cold of the Sound, the apartment was a sanctuary of warmth. 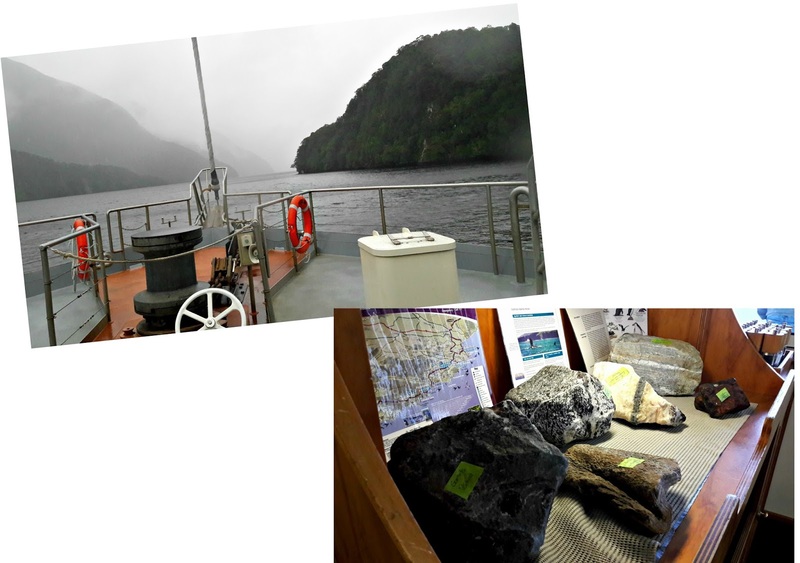 The next morning, we said goodbye to the little black lamb, loaded the luggage into the car and drove the short distance to the Te Anau Visitor's Centre to board the Real Journeys boat for a ride across Lake Manapouri. 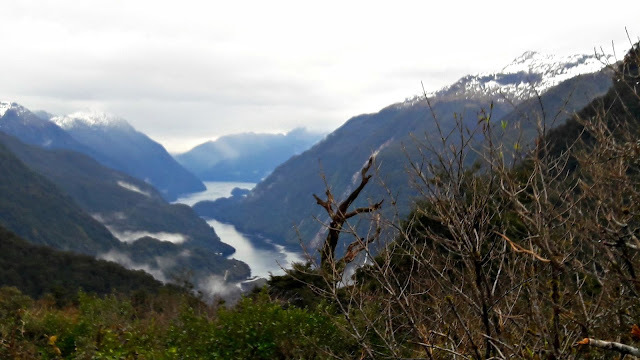 At Manapouri, it was a coach that took us over the Wilmot Pass, the most expensive road in New Zealand and the only one not connected to any other road network. As we set out, we could see the hydroelectric power station that supplies power to a nearby aluminium smelter. Our driver explained the sights, history and the kinds of wildlife that inhabit the sub-alpine Pass region. We saw several traps along the sides of the road; possums are disliked with a vengeance in South Island because they have have been responsible for the decimation of many native bird species that used to inhabit the dense rainforests. The Fiordland Navigator was waiting for us at Deep Cove for an overnight cruise to Doubtful Sound. It's a really big boat with a crew that was good at multitasking. We were a group of 70 from various parts of the world. After we were shown our cabins below deck where we left our bags, we came back up to go around the boat. Coffee, tea and hot chocolate are always available and alcohol and snacks are sold at the bar. The crew then organised water activities for the passengers. 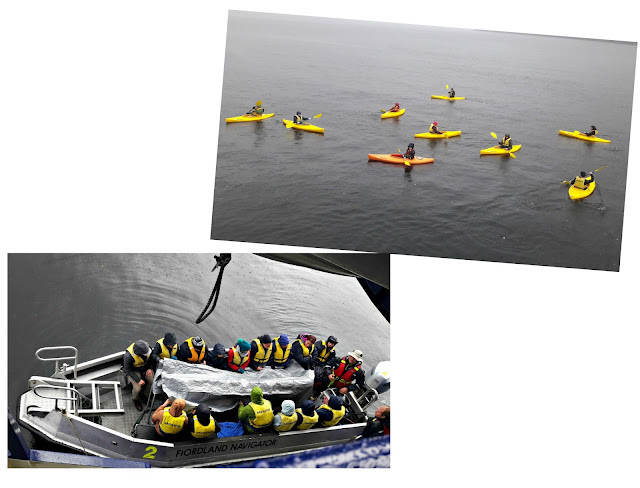 Adventure sports enthusiasts got into kayaks and rowed around while a tender boat was lowered into the water and some passengers got in for a quick sail-about. Three of the most sporty guys dived from the boat's railings into the freezing waters for a bit of a swim. Soon, the crew herded everyone back into the Navigator and then it was time for hot soup and bread. 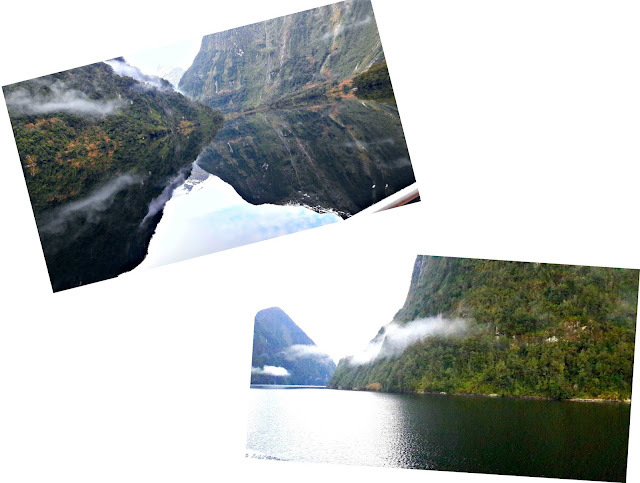 Wondering how Doubtful Sound got its name? 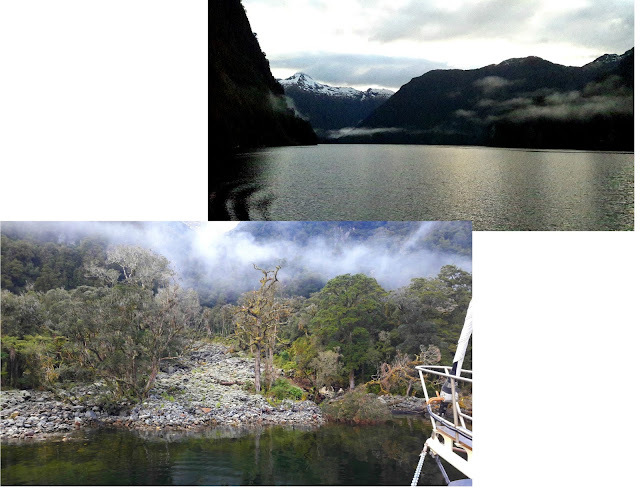 Way back in 1770, Captain Cook was sailing in the area and saw the mouth of the fiord. He named it Doubtful Harbour as he was unsure if he would be able to navigate out if he entered it - talk of missed opportunities! Later, men who hunted whales and seals in the area renamed it Doubtful Sound. 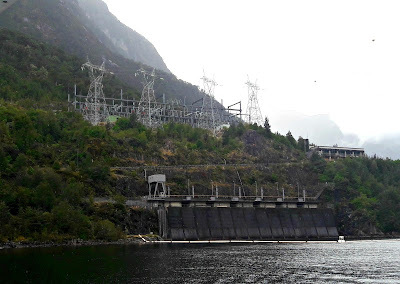 The second largest of the fiords and the deepest, it is a pristine, misty, beautiful yet untamed environment where it rains one minute and the sun shines bright the next. The trees that cover the hills are in all shades of green, the water that meets the shore is stained dark from the tannins of the forest floor. Below it is the salt water of the sea and the 2 layers do not mix, you cannot see into the depths. 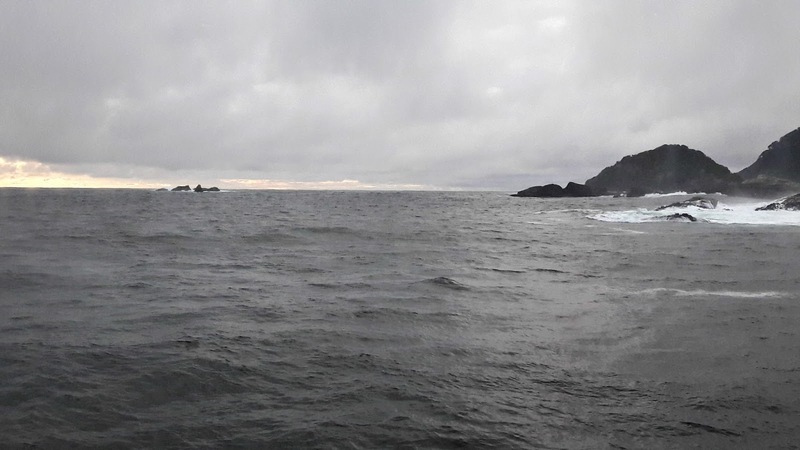 The waters of the Sound are calm and still in some places but as you get closer to the Tasman Sea, there are waves and swells. We did hope to encounter fur seals but they were not around that day. If you have ever wondered what our planet looked like millions of years ago, this part of New Zealand will have some of the answers. The conservation of this environment is fiercely guarded; in fact, the only way to Doubtful Sound is either through the Pass or by the sea. The sound of the engines woke us up in the morning. After breakfast, we braved the light drizzle and stood on the deck. At one point, the engines were switched off again, the Captain told us all to be very quiet so we could hear the sound of the birds and distant waterfalls. All too soon, we were back at Deep Cove and back in the coach, at the end of a journey to one of the most magical, raw and unspoiled regions of the earth. 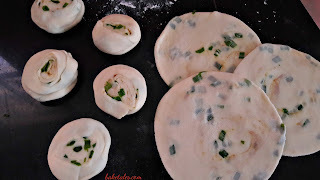 This time, it's a recipe for pan-fried Chinese pancakes with spring onions as we ended our day at a Chinese restaurant. Add the boiling water; mix with a wooden spoon till cool enough to handle. Knead till the dough is smooth, keep covered for about 30 minutes. Roll out the dough into an 8"x 16". Brush the top with the oil mix, sprinkle over 5-spice powder followed by the spring onions. Roll up into a tight roll, slice into 8. Press each slice between the palms, roll out into 4" discs, sprinkle some of the sesame seeds on each side and press in. Heat a griddle, pan-fry the discs, brush on a little of the remaining oil on each side and remove when done.. 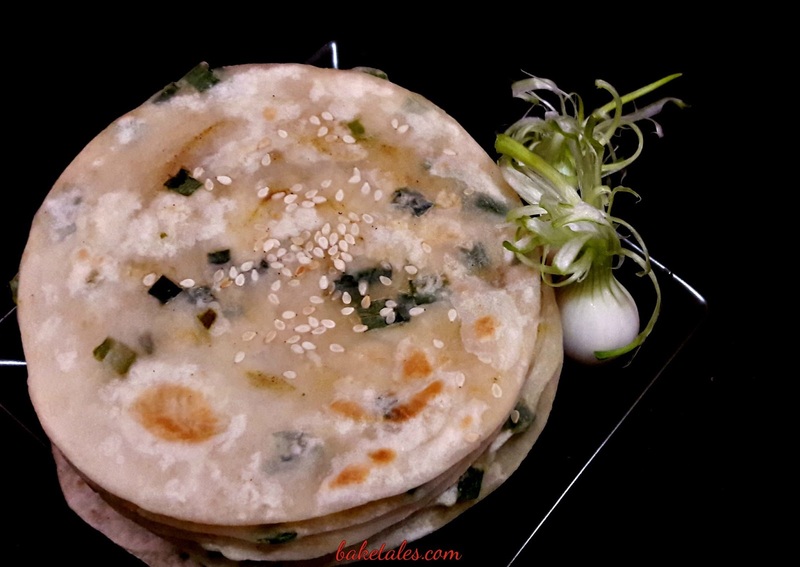 Delicious on its own or use as a wrap with stir-fried meat or veg.